Donnington Race Track is a premier motor racing venue in the UK. Taking in such events as the British Superbike Championship and the British Touring Car Championship. When it was time to revamp the track’s executive boxes the owners wanted to use a material that would be modern, easy to install and would be able to cope with regular heavy usage with minimum maintenance. Not all flooring options were available to fit the remit. With events happening in and around the race track on a regular basis the proprietors needed something which would upgrade their executive boxes with a minimal amount of disruption. They took the decision to install flooring in one box to gauge whether a larger project would be feasible. A number of flooring providers were contacted to provide a tender for a test executive box. We were able to showcase the robust build quality and straightforward installation of our composite decking. 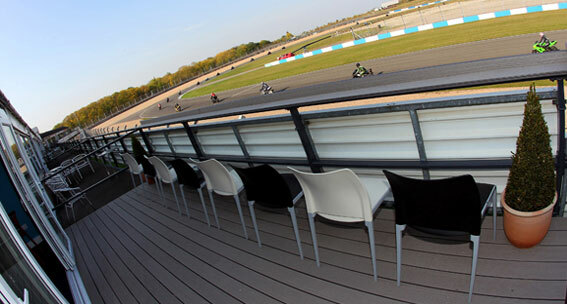 We were also confident that our product was the ideal choice for Donnington Race Track. The proprietors agreed and our grey composite deck boards were chosen for their contemporary colour in addition to being anti-slip and low maintenance. Our solid composite decking is ideally suited for heavy use and is made to last. With the benefits of both the 40% HDPE recycled plastic and the 60% FSC® certified timber. Resulting in a sturdy and low-maintenance product with a rich colour which gives a standout look and feel. We shipped our decking to the stadium the day after it was ordered and it was installed in an afternoon. The concealed clip system that is employed to secure our composite decking together makes installation straightforward meaning that jobs can be completed to deadline. We are very happy how the executive box decking turned out and we look forward to receiving the order for the other boxes soon.